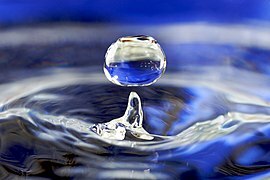 Water (H2O) is a transparent and nearly colorless chemical substance that is the main constituent of Earth's streams, lakes, and oceans, and the fluids of most living organisms. Annual mean sea surface temperature for the World Ocean. Data from the World Ocean Atlas 2001. Shipot, a common source of drinking water in a Ukrainian village.